About: Duncan McMurray found three suitable bachelors to court his cousins and then he was called away on a Texas Rangers mission. No matter. He left the bachelors train tickets to the ranch and went off on his mission fully expecting things to go smoothly on the home front. This left the door open for gambler Lewt Paterson to separate one of the tickets from it’s intended bachelor. He played cards and sent the poor inebriated soul on a train wearing Lewt’s clothes and traveling in the opposite direction of the ranch. Duncan’s cousins welcome the visitors for a week of McMurray hospitality and time to get acquainted. The sisters are lovely but they have a secret they hope no one will discover. My thoughts: Lewt Paterson and Emily McMurray’s story is the prime focus of the novel. I liked how Jodi Thomas developed the two characters. They each had a less than ideal childhood and thought it would be easier to pretend to be someone else for the week in order to find the life they wanted to live. Emily didn’t want to marry or leave the ranch and Lewt just wanted to leave the world of gambling and marry into a normal family. Duncan’s mission turned out to be more than he’d expected. It started out to be a cattle rustler round up but when things went awry Duncan found himself captured on the wrong side of the border. He wasn’t the only one being held against his will. There was a young woman who was resigned to a dismal fate. Duncan was determined to escape and also free the girl. I wasn’t sure how Jodi Thomas would write her characters out of that situation but I knew she could! I thought the pace was perfect. The balance of humor at the ranch and the drama of Duncan’s mission with the Rangers was just right. 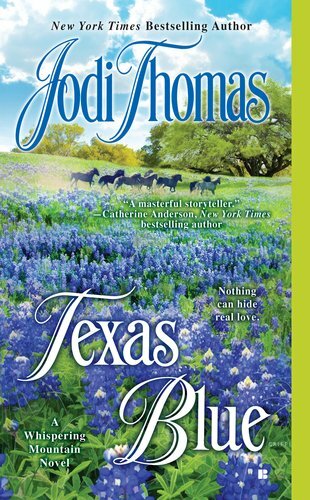 Texas Blue is the first of Jodi Thomas’ historical novels I’ve read and I look forward to reading more. Recommend? Yes – to fans of historical romance, Jodi Thomas, and the Whispering Mountain series.